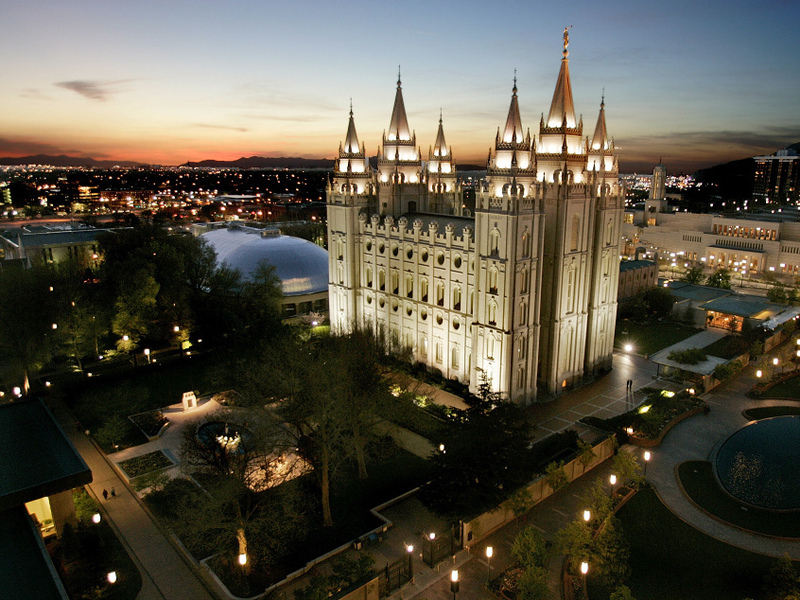 Mormon Leaders Warn Followers To Stop Controversial Baptisms : The Two-Way Mormons around the world are getting this warning Sunday: Stop posthumous baptisms of "unauthorized groups, such as celebrities and Jewish Holocaust victims." The sun sets behind the Mormon Temple, the centerpiece of Temple Square, in Salt Lake City. Mormons around the world are getting this warning Sunday: Stop posthumous baptisms of "unauthorized groups, such as celebrities and Jewish Holocaust victims." "Our preeminent obligation is to seek out and identify our own ancestors," says a letter to be read in every Mormon congregation. "Those whose names are submitted for proxy [baptisms] should be related to the submitter." Mormons who continue to embarrass the faith by submitting the names of celebrities and Holocaust victims for the proxy baptism rite will lose access to the Mormon genealogical records, the letter warns. "Other corrective action may also be taken," it says. The letter is signed by church President Thomas Monson and his two "counselors" in the Mormon First Presidency, the top leadership of the faith. The warning follows an avalanche of criticism about the Mormon practice of baptizing deceased souls into the faith. In recent weeks, an excommunicated Mormon who continues to do genealogical research in church baptism records has found the names of prominent Jews and Holocaust victims, including Anne Frank and Daniel Pearl, the Wall Street Journal reporter captured and killed by terrorists in Pakistan in 2002. "We welcome this as an important step," says Abraham Foxman, the national director of the Anti-Defamation League and a Holocaust survivor. "Church members should understand why proxy baptisms are so offensive to the Jewish people," Foxman adds, citing "near annihilation during the Holocaust simply because they were Jewish" and "forced conversions throughout history." Jewish leaders first raised concerns about the practice and the inclusion of Holocaust victims in 1992. Several meetings with Mormon leaders in the two decades since have resulted in promises to remove the names of Holocaust victims from Mormon baptism rolls and to screen baptism lists for those who died in concentration camps. But some Mormons continued to place the names on baptism lists and conduct proxy baptisms in which the name of the deceased is read aloud while a living proxy is immersed in water. The controversial practice has even touched the presidential campaign of Republican Mitt Romney, a faithful Mormon. Holocaust survivor and Nobel laureate Elie Wiesel called on Romney to denounce inappropriate baptisms after discovering Wiesel family members had been posthumously baptized. Romney's campaign referred questions about Wiesel's statement to the Mormon Church. Mormons believe the ceremony has no effect if the deceased soul rejects it. Mormon policy, as the letter restates, is to confine the baptisms to ancestors, but as recently as 2009, one of the highest-ranking leaders of the church indicated otherwise. Quentin Cook is one of the faith's Quorum of the Twelve Apostles, the group at the top of church leadership. During a tour of a new Mormon Temple in Draper, Utah, Cook described the posthumous baptism practice and belief. "We concentrate first of all on our ancestors and then for the people in the world at large," Cook told NPR. In recent weeks, Mormon officials said they had punished at least two followers who had violated Church policy by baptizing prominent Jews who were not among their ancestors. The members involved lost access to the baptism system and a church spokesman said more serious sanctions are possible. Proxy baptism is a fundamental tenet of the Mormon faith and followers are encouraged to participate. Millions of Mormons have gathered and placed billions of names into church genealogical records. Volunteers travel to Mormon Temples to conduct the baptism ceremony. Mormons believe the rite offers deceased souls the opportunity for eternal salvation, but Foxman says the Mormon Church should "reconsider all the implications of continuing the practice of posthumous baptism, as it has re-evaluated other of its traditions."